I have been an Ilona Andrews fan ever since I read the Kate Daniels series in 2010. I think that’s pretty obvious if you take a look at my current blog header because the design was partially inspired by the series. I can still remember devouring the first four books in the series that were out at that time. I read the first two books and thought the story and the characters were interesting. Then I picked up Magic Strikes and BOOM! I fell in love with the series and I haven’t looked back. I’ve tried reading other urban fantasy series and Kate Daniels is still my favorite. There’s just so many things to love in this series – from the flawed characters who are so easy to love and care for to the magic vs. tech world they live in. So of course, I wanted to read Magic Shifts as soon as it was released. Unfortunately, I was swamped with work during the week so I had to wait until the weekend before I can dive back into this world. It’s been a few weeks since I finished reading the book but I haven’t been able to catch up on reviews until now. Spoiler warning: this review will contain spoilers for the earlier books. Reading a new book in a series that you love is similar to coming home. That’s how it feels like whenever I pick up a Kate Daniels novel. I’m familiar with the world, with the characters and I trust Ilona and Gordon enough to know that I’ll enjoy whatever they write. The main story arc of the previous books was concluded with Magic Breaks, with Kate and Curran giving up the leadership of the Pack. I was curious what direction the story will take after that. In that aspect, I was wholly satisfied with the changes that Kate and Curran have made in their lives because I felt that they remained true to themselves. It felt realistic and in keeping with their personalities. As the series has progressed, the characters and their relationships have also developed. Even though Kate has been with Curran for several books now, their relationship still has its ups and downs and I like seeing them deal with their problems together. I also enjoyed seeing all the other characters I’ve come to love like Julie, Derek, Andrea and Raphael, Dali and Jim, Dolittle, etc. It’s nice that we still got to see Pack members even if Kate and Curran are technically not members of the group anymore. I also liked seeing more of Roland! I think he’s a really good complex character, and it will be very interesting to see what will happen to him in the last two books in the series. The magic in each Kate Daniels book has been inspired by a different mythology. In Magic Shifts, the focus is Arabian mythology. I really feel like the authors research the subject matter intensively and it shows in their writing. 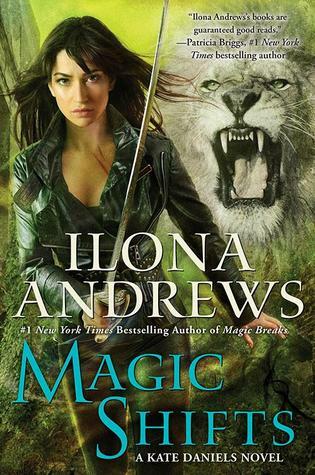 While I didn’t feel like Magic Shifts is one of the stronger books in the series, it was still a lot of fun for me to read it. Like I said earlier, diving into a favorite series is always a good idea. After finishing the book, I immediately wanted the next one in the series. There were hints about what can happen in the near future and I’m really looking forward to finding out more about Kate and Curran. Just two more novels until the whole Kate Daniels series ends! I can’t wait to see how things will unfold. Of course I want these characters to have their happy ending and I will be keeping my fingers crossed for that. Ever since I fell in love with the Kate Daniels series, Ilona and Gordon have been auto-buy authors for me. So of course, Burn for Me was one of my most anticipated releases this year. I’ve been eagerly waiting for it especially when Ilona mentioned that the set-up of the world is similar to their Kinsmen novellas, Silent Blade and Silver Shark (which I both loved). I did a book swap with my lovely friend Holly and she sent me her review copy of Burn for Me. I read it as soon as I opened the package. I would have devoured the whole thing in one sitting if I didn’t have to stop and get some sleep because I had to go to work the next day. It’s been a few weeks since I got the package and I’ve already reread the book – it was that good of a read for me. Then she’s kidnapped by Connor “Mad” Rogan — a darkly tempting billionaire with equally devastating powers. Torn between wanting to run or surrender to their overwhelming attraction, Nevada must join forces with Rogan to stay alive. First off, I want to highlight that Burn for Me is the first book in a trilogy that focuses on Nevada and Mad Rogan. For some reason, I thought it was a trilogy that would feature different couples in each book, similar to the Edge series by the same authors. The Hidden Legacy trilogy is more like the Kate Daniels series in the sense that it has a slow burn romance spanning several books. This is more than okay with me because I love a good romance that has a slow build up. Especially one that starts with both parties not trusting each other, as was the case with Rogan and Nevada. Rogan is rich, extremely powerful and used to getting his way. This doesn’t go so well with Nevada and they clash when they first meet. But they’re also insanely attracted to each other so there’s a lot of tension and banter. Some of the back and forth teasing made me laugh out loud. Nevada tries to ignore the attraction because she’s a sensible and practical person who doesn’t want complications in her life. She has enough on her plate as the main breadwinner for her eccentric family (grandma, mom, sisters and cousins). Nevada’s family is hilarious, basically a bunch of quirky characters who constantly argue but really love each other to death. Hijinks ensue when Nevada is forced to work together with Rogan to achieve a common goal. Her family also gets involved in all the fun. The Hidden Legacy world is very similar to our own, with the exception of the discovery of a serum that activated people’s magical abilities. Power, instead of money, has become the measure of one’s worth in the world. Alliances and marriages are made based on magical prowess. Powerful magical families are the ones who control and govern cities and countries, kind of like magical mafias. The worldbuilding has echoes of the Kinsmen and Kate Daniels novels but still remains very much its own. I’m amazed at how Ilona and Gordon are able to create such interesting worlds for their books. Nevada’s personality also reminds me a bit of Kate Daniels because they’re both no-nonsense individuals who are working in similar fields – investigative work. Plus they both have magical abilities and are more than capable of defending themselves in a fight. Nevada is still in the process of coming into her powers and it would be interesting to see how that develops in the next books. Reading (and rereading) Burn for Me was a real pleasure for me and I wanted the sequel the moment I finished the book. I feel like Burn for Me is a good introduction to Ilona Andrews for anyone who hasn’t read their work because it’s the first in a new trilogy, which means it doesn’t require that much commitment from a reader. Also, I think it has all of the things that I enjoy in their books – solid worldbuilding, great characters, romance and banter. Recommended for fans of adult urban fantasy, Burn for Me has made it to my best of 2014 list. It’s going to be a long wait for next year’s releases for both Kate Daniels and Hidden Legacy. 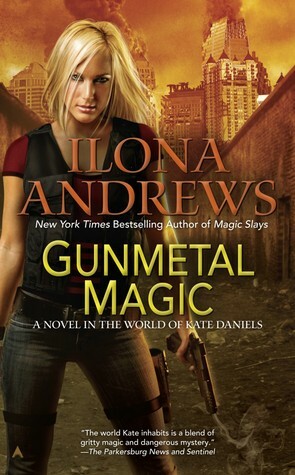 The Kate Daniels series by Ilona and Gordon is my favorite adult urban fantasy (UF) series. That may not be saying much since I currently only follow two adult UF series: Kate Daniels and World of the Lupi by Eileen Wilks. I have, however, tried other series but didn’t feel compelled to continue beyond the first few books. I read more epic fantasy than UF prior to falling in love with the Kate Daniels novels but I’ve been more willing to try UF after that. I can still remember when I was first introduced to the series, there were only four books out at that time. I’ve been eagerly anticipating each new novel every year since then. If you feel like we have similar tastes in books, I think you should give this series a try. Also, see my blog banner with the huge lion and the warrior girl? That was totally inspired by Kate and Curran. As the mate of the Beast Lord, Curran, former mercenary Kate Daniels has more responsibilities than it seems possible to juggle. Not only is she still struggling to keep her investigative business afloat, she must now deal with the affairs of the pack, including preparing her people for attack from Roland, a cruel ancient being with god-like powers. Since Kate’s connection to Roland has come out into the open, no one is safe — especially those closest to Kate. It’s always such a comfort to dive into a new installment of a favorite series, books that are set in a familiar world and have characters who feel like old friends. Magic Breaks was one of my most anticipated releases for this year and I was super excited to read it. The authors also announced that this book will conclude the main arc and conflict that has been building up in all the previous books. So I was also a bit nervous going in because I had no idea what would happen. I shouldn’t have worried. 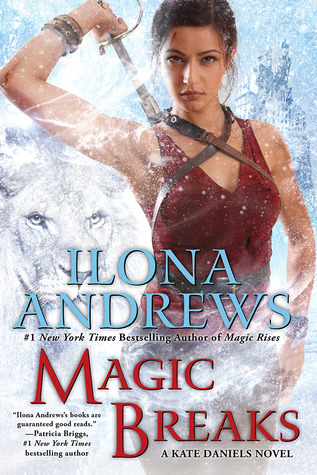 Ilona and Gordon are great storytellers and I had so much fun reading Magic Breaks. The humor that I’ve come to love in the series is present in this one. Certain scenes with back and forth banter cracked me up. I also like seeing how much Kate has changed and matured since the series started. She’s a much better leader now and is more level-headed. I like her development as a character, the way she started as a lone wolf (figuratively speaking since she’s not a shapeshifter) to someone who is now in charge of a huge shapeshifter Pack and has a handful of people she trusts. She’s willing to go through so much to keep these people safe and they are willing to do the same for her. I also liked seeing the growth and transformation of secondary characters – this far into a series, we’re all bound to have our own favorites. Some of the ones I really like are Andrea, Raphael, Jim, Derek, Ascanio and Dolittle. Even the villains have such interesting personalities that it’s hard not to like them even if I know they’re evil, they come in shades of gray and we see the motivations behind the things that they do. I missed seeing certain characters but then it’s expected that not all of them will get page time in each novel. I have always been a big fan of the slow burn romance in the series and I love seeing Kate and Curran’s relationship develop over time. Even after they got together, it wasn’t always smooth sailing for them. As both of them continue to grow, so does their relationship. I’m happy to announce that their romance is on much better footing in Magic Breaks compared to Magic Rises. It’s difficult to discuss how much I enjoyed Magic Breaks without going into details and spoilers. Let me be vague and just say that I was satisfied with how the main arc was resolved because I found it believable. I was thinking that if it went in a different direction, I might not have felt that it was realistic for the characters. Magic Breaks just really worked for me and I loved it. The Kate Daniels series remains my favorite urban fantasy series and I can’t wait to find out what the last few books will have for its fans. I felt a bit lost after finishing Magic Breaks and kept discussing it with friends who have read the book. I had a book hangover and some of my favorite scenes from the series kept running through my mind. It took a few days for me to start another novel (which is rare for me unless I’m in a slump) since I wasn’t in the mood to leave the series behind. It’s a good thing the authors have another book scheduled for release this year, Burn For Me, so I still have something to look forward to. I enjoyed reading Rachel Neumeier’s House of Shadows so I jumped at the chance to read Black Dog when I was offered a review copy. I was intrigued when I first found out the premise of the book. Also, I wanted to see how Rachel’s writing will translate from epic fantasy to urban fantasy. It’s been weeks since I finished reading Black Dog and I still have fond memories of it. I remember staying up late one week night to finish reading this novel. It didn’t take that much effort for me to be immersed in the story and I found myself absorbed until I reached the end. I found the characters intriguing and felt that the worldbuilding was solid. I like how the reader is thrown into the story without lengthy descriptions, you just learn more about the world as you keep reading. The magic in this world can be found in black dogs and the Pure. Black dogs are shapeshifters who can change from their human to black dog forms as needed. While Pure women are able to wield their magic to invoke peace and to protect other people from malicious magic. The calmness that the Pure can provide serves as a counterpoint to the anger and violence that are part of a black dog’s nature. Natividad is a Pure, her brother Alejandro is a black dog while her twin Miguel is human. I like how these three siblings each have their own strengths and weaknesses. They each have something to contribute to their family, and eventually the Dimilioc clan. Even Miguel, who has no supernatural abilities, has skills in other areas. Aside from having magical skills, I also found it interesting that these siblings are half-Mexican and half-American. They were brought up in Mexico but had to flee to North America to run away from danger, and to hopefully gain allies in the Dimilioc clan. The Dimilioc black dogs also have a mix of interesting characters and I was curious about them as well. Further proof of how much I enjoyed reading this book was that it reminded a little of the World of the Lupi series by Eileen Wilks, which was one of my favorite discoveries last year. 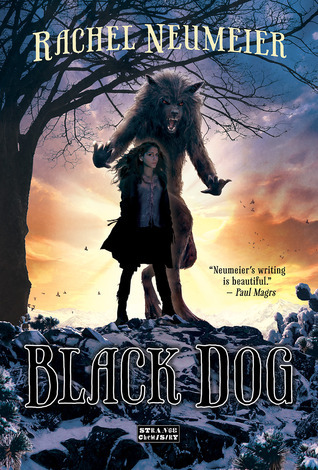 I’m happy to report that I feel like Rachel Neumeier made a successful foray into urban fantasy with Black Dog. Like I said, I look forward to reading the next installment in the series. Blood Lines is the third book in the World of the Lupi urban fantasy series by Eileen Wilks. The first two books are Tempting Danger and Mortal Danger. The series has to be read in order. It follows Lily Yu, a third generation Chinese immigrant in the States, working as a cop. The story in the books also revolves around Lily’s connection with Rule Turner, the heir of Nokolai, one of the dominant lupi clans in the world. I like reading about how they’re both changing and adapting to their lives. They’re both strong-willed and well-respected in their own circles and it’s fun to see both of them give way to the other person when the occasion calls for it. There’s also a strong need for both of them to protect each other, which is a difficult task considering the adventures that they get into. As I’ve mentioned in my reviews of the first two books, the series also highlights the complex relationships that both Lily and Rule have with their families. One of my favorite characters in the series is Lily’s grandmother, Li Lei Yu, and it’s such a delight to come across scenes that include her. In this installment, friends also play significant roles in the book’s plot. Cullen Seaborne and Cynna Weaver are as much a part of this story as Lily and Rule are. The former is Rule’s fellow lupus, who is a talented sorcerer while the latter is Lily’s co-worker who also has her own magical abilities. It may sound confusing to keep track of so many characters but keep in mind that this is already the third book and there has been enough time to introduce other characters and let readers get to know them. I feel like the writing in the series keeps improving as I go along, which makes me look forward to the most recently published books. Eileen Wilks continues to build upon the world that she created, adding more layers to the setting that was initially introduced. There’s more information about the lupi as well as other magical beings in the world. Even though the characters are based in the United States, I like how the setting encompasses the rest of the world – e.g. not just the American lupi clans are represented in the books. Most of my downtime this past weekend was spent reading as much as I can of this series. I finished the first book before the weekend started and it’s Monday night and I’m currently in the middle of the fourth book. At this point, I feel like I’m just coming up for air so I can talk about the books. It’s challenging to keep these reviews spoiler-free (I haven’t mentioned details in the first two books that can be considered spoilers and I didn’t even include the synopsis for each) but I want more readers to give this series a try. I don’t know if I’m just in the right mood for a new urban fantasy series to follow but I find the World of the Lupi engaging. Maybe I can just write about the series as a whole after I finish reading all the novels that have been released. When I read a series as quickly as I’ve been doing with this one, the plots in each book start to blur together and it all becomes just one big story arc in my mind. Besides, I would rather dive straight into the next book rather than pause and gather my thoughts so I could write a review for the one that I just finished. It’s funny because when I finished the first book, I said there were too many books in the series. I have a feeling I’ll be able to finish all of them soon. Mortal Danger by Eileen Wilks is the second book in the World of the Lupi series. I started reading this one right after I read and reviewed Tempting Danger. Should the series be read in order? Yes, because we follow the same set of characters throughout the whole series and it would be too confusing if the books aren’t read according to how they were published. For the benefit of those who haven’t read the first book, I won’t be going into specifics to avoid bringing up spoilers. Even just the premise of the second book already has spoilers for the first one so skip reading that if you’d rather not know too much before going into the series. 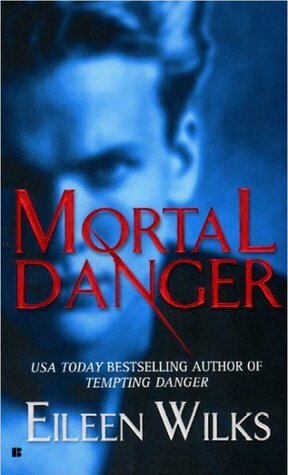 Before I get into anything else, I just have to comment on Mortal Danger’s cover because I’m really not a fan of it – all blue background with a fuzzy picture of a scowling guy. I don’t think it represents the contents of the book well, I’m not even sure who that guy in the background is supposed to be – Rule? Cullen? So if you’re being discouraged to try the book because of its cover then you can go ahead and ignore it. In this case, you really shouldn’t judge the book by its cover. As the title of the series suggests, Eileen Wilks’ urban fantasy world does have werewolves in it. They’re more politely referred to as lupi (singular: lupus). And they’re not the only magical beings in this world. What makes the setting interesting is everything is changing as the series starts – lupi have recently been recognized as citizens (with human rights) instead of being hunted down as they used to be. They’re a very secretive bunch, as a result of their persecution in the past, and I keep reading because I want to know more about them. We do learn a little more about the lupi in the second book but there’s still more to their culture and history that can be explored. With all the changes happening in their lives, the main characters – Lily and Rule – grow as people. As a result, their relationship also develops. What I like about their connection is even though the physical bond is there, they still have to work on the emotional side and all the baggage that comes with it. Both of them are also big on family so their relatives play a big part in their relationship. That’s something that I feel will continue with the rest of the series. The romance is an important aspect of the series but there’s more to the books than Lily and Rule’s love story. That comes with the territory, given that they lead complicated lives because of their roles in society. I felt that the first book had a slower pace that what I’d usually like in my urban fantasy reads and I guessed that it was because it served as introduction to the series. I was partially correct because the second book had more action than the first one. However, there’s still a lot of explanation and speculation going on – people trying to figure out the unusual and unexpected things happening in their world and trying to come up with ways to adapt to them. And also to solve the problems that pop up along the way. I didn’t have much of a problem with the pace, I’m currently in the middle of the third book and I feel like I’ve gotten used to the writing. It helps that all those explanations help us readers to understand the world better and there are many details to like in this world. Not the least of which is Lily’s Chinese heritage and how her background and her family give the series an Asian flavor. I was also surprised at the direction that Mortal Danger took and like I keep saying, it’s a good thing when the book that you’re reading manages to surprise you. Everything got resolved in a very satisfying way but still left me hungry for the next installment. I recommend this series to fans of adult urban fantasy. As my friend Estara pointed out: the World of the Lupi was published before Kate Daniels, Mercy Thompson, the Alpha and Omega as well as the October Daye series. And yet it isn’t as well-known as all of those other novels. 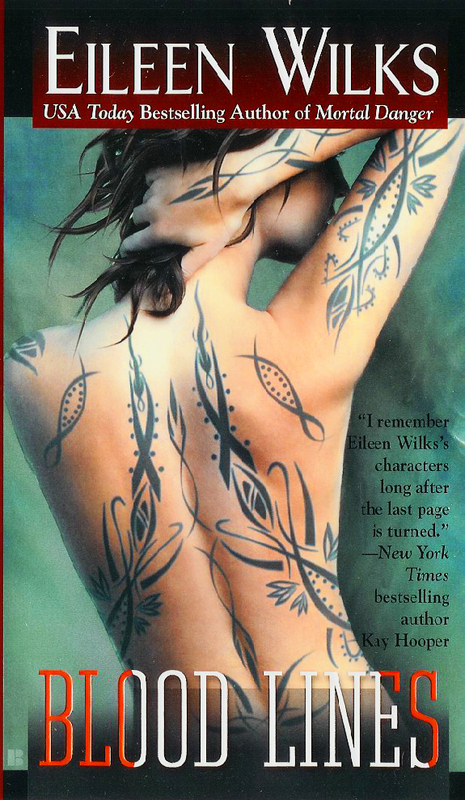 As I continue reading Eileen Wilks’ books, let’s see if I can try to convince more readers to pick them up too. They are definitely worth checking out. I have been meaning to read more urban fantasy because I want to find a series to follow aside from Kate Daniels. I’ve read the first three Mercy Thompson books and the first two October Daye novels but felt no need to continue with both series. I know so many friends love those two series and it makes me a bit sad that I wasn’t able to connect with them like I wanted. I might change my mind later on and give those two a try again but for now, I’m interested in discovering new-to-me series. The World of Lupi books by Eileen Wilks come highly recommended by Estara, she says it’s a must read for urban fantasy fans. It’s funny because I started the first book and immediate thought that it feels like a mix of both Mercy Thompson (werewolf hierarchy, culture and history) and October Daye (both MCs are investigating murders and they have special skills that come in handy for the situation). Lily Yu is a third generation immigrant in the US and I think it’s awesome that this series has an Asian female protagonist. There are no lengthy introductions about the world at the start of the novel, readers are just thrown into it and we learn more details as we go along. I did find the pace a bit slow but first books tend to be like that, to serve as an introduction to the series. I felt like there was more speculation, more thinking on Lily’s part rather than action. It’s a minor quibble because I was still engaged and kept reading to find out more. I found myself curious about this world and how magic is structured in it. The lupi seem like they have a rich culture and history, that isn’t well-known to outsiders. I look forward to learning more about them. Of course, I was also interested in the attraction between Lily and Rule. I wanted to find out how both of them will react to this unexpected connection between them. Both Lily and Rule are complicated people and we get to know them a little in this first installment. However, I feel like we’ve barely scratched the surface and there’s a lot of room for more character development and worldbuilding. I like how the story isn’t just focused on the two MCs, we also get to know their friends and family. Families are very important to both of them. I’m a fan of Lily’s traditionally Chinese grandma, would love to know more about her. While Tempting Danger can stand well on its own, I am curious enough about the characters and the world to continue with the rest of the series. There’s obviously more in store for Lily and Rule. I just find it a bit surprising that there are already nine books that have been released with more in the pipeline. I’m not sure if one couple’s story arc that takes that long will be able to hold my attention. I haven’t read the summaries for the latter books because I don’t want to see spoilers. I know there can be a lot that can happen by also focusing on secondary characters, all those friends and family that are significant in Lily and Rule’s lives. I guess we’ll just have to see how it goes. I’m keeping my fingers crossed that this series will work for me! I’ve already started the second book. I recommend Tempting Danger to urban fantasy fans, specifically the Mercy Thompson and October Daye series. I find it a bit surprising that Eileen Wilks isn’t more well-known. 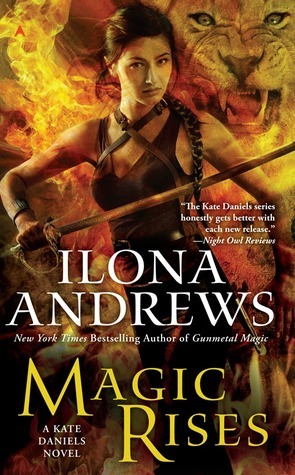 I’ve been saying this a lot recently: the Kate Daniels series by Ilona and Gordon is my favorite urban fantasy series. The latest installment, Magic Rises, was one of my most anticipated releases this year. When a title I’m excited about becomes available, I usually read it as soon as I can. But since I haven’t reread this series since I first discovered it, I thought it would be a better idea to reread the earlier books instead of diving right into Magic Rises. I crammed as much reading time as I can during the past few days. I was hoping that I’d have time to catch up on reviews and other blog posts while rereading but no, I was sucked into Kate’s world again and ignored the blog while I was rereading. If you haven’t read the series, then please skip this review because I wouldn’t want you to see any spoilers. It feels great to be immersed in a make-believe world that I love, one that is filled with characters I’m fully invested in. When it comes to good storytelling, the authors continue to build upon an established setting as the series progresses and that is exactly what Ilona and Gordon have been doing with the Kate Daniels world. In each book, a different kind of mythology is presented and we get introduced to new (good and bad) characters. What sets Magic Rises apart from the other books in the series is that Kate, Curran and company travel to a different region and the readers get a glimpse of how things are like outside the United States. The beautiful Mediterranean setting was like a breath of fresh air and it was interesting to see how different European shapeshifter packs are compared to the Atlanta Pack that we’re used to. I love how relationships got explored and developed further in this novel. After a couple of books into the series, we already know some of the characters quite well and yet there are some aspects of their personalities that were shown in a different light. I may not have been a fan of the actions of certain individuals in this one but I had a feeling that they were being done for a reason so I didn’t let it bother me. I was just going with the flow, waiting for the story to unfold. There was one scenario that occurred in the book that I was able to predict beforehand and I had so much fun reading about it. I found it funny, especially because it made things more complicated. Yes, I am being very vague on purpose. I don’t want to ruin the reading experience for those of you who haven’t had a chance to read this yet. 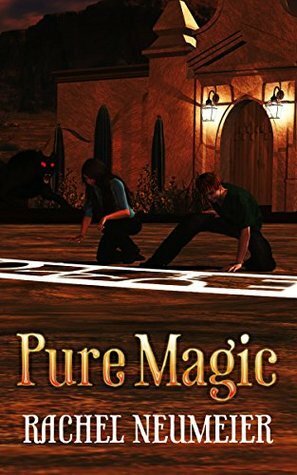 Magic Rises managed to surprise me in different ways and as a result, kept me glued to the screen of my Kindle – it is an action packed story peppered with the humor and wit that we’ve come to expect from the series. The fight scenes in this one were made of pure win, I really enjoyed reading them even though I know next to nothing about physical combat. They were the kind of scenes that I would love to see on a movie screen. On the night that I started reading Magic Rises, I stayed up late to go through as many chapters as I can. I would have kept going if I didn’t have to worry about getting up in the morning to go to work. When I got to the office the next day, I couldn’t wait for the work day to end so I could get back to reading this and I was distracted for most of the day, thinking about the book. Definitely one of my favorite reads this year. I can’t wait for the next novel! For some reason, I thought the next one will be the last in the series but apparently we will be getting more Kate Daniels books. I look forward to reading all of them.